Help Us Finish Our Movie! Join the Yes Men Andy Bichlbaum and Mike Bonanno for a party and fundraiser to help finish their hilarious new documentary The Yes Men Are Revolting, hosted by G.O.P. drag princess Sylvia Bismarck. 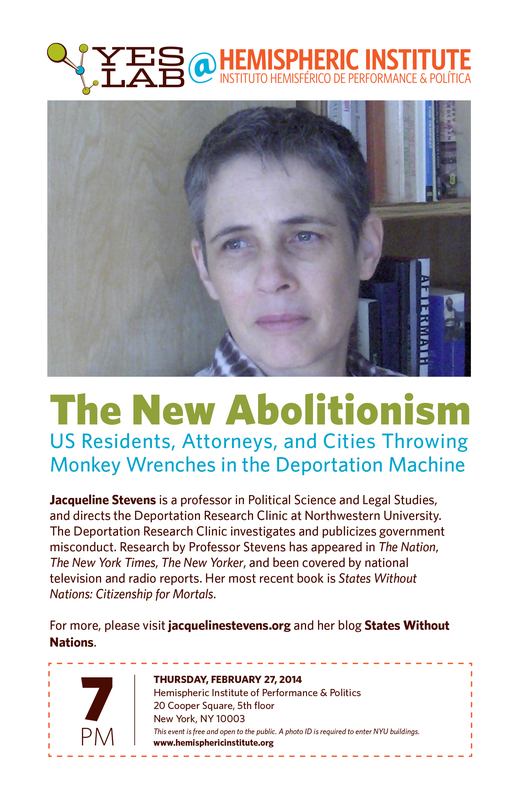 Jacqueline Stevens is a professor in Political Science and Legal Studies, and directs the Deportation Research Clinic at Northwestern University. The Deportation Research Clinic investigates and publicizes government misconduct. Research by Professor Stevens has appeared in The Nation, The New York Times, The New Yorker, and been covered by national television and radio reports. Her most recent book is States Without Nations: Citizenship for Mortals. For more, please see http://jacquelinestevens.org and her blog States Without Nations. Do you want to dramatically amplify your impact on decision-makers, media, and the public? Are you need of new skills, tools, and approaches that will get you fired up to create innovative campaigns? Is it time to start thinking (and acting) outside the box? Three of the leading creative action organizations in the country – Beautiful Trouble, The Yes Lab (brainchild of the Yes Men), and the Center for Artistic Activism – are joining forces for a special weekend of trainings for organizations, networks, and activists. We will be conducting a 2-day intensive training February 8 & 9 at NYU and delving deep into all our creative toolboxes. Also, the Yes Lab will be unveiling our powerful new action development tool, the Action Switchboard. It’s going to be an exciting weekend where we all learn how to up our collective game. Individuals as well as organizaitons are encouraged equally to apply. If you’d like to join us, APPLY HERE. If you can't make it, pass the word on to friends and colleagues. We are expecting more applications than there are spots in the workshop so not everyone who applies will be able to participate. We will start contacting accepted applicants on Feb. 1st. The training is two full days: Saturday Feb 8 from 10-6 and Sunday Feb 9 from 10-5. The first day will be focused around strategy and principles, the second day applied tactics. We strongly encourage groups to attend both. TACTICS! We will dig deep into the Beautiful Trouble toolbox of creative tactics, which will offer your team a full spectrum of tools for creative brainstorming…. When and how to use specific tactics like: Human Banner, Guerrilla Projections, Creative Disruption, Flash Mob, Media-Jacking, etc. You will also be among the first to be introduced the Yes Lab’s revolutionary new tool, the Action Switchboard. The Action Switchboard is a human-staffed web-platform that connects activists, organizations, and people with skills in order to create and execute creative direct actions. Anyone can propose an action, recruit participants, and solicit funding all with the help of Yes Lab trained facilitators. Organizations can even sponsor issue areas or goals around their campaigns. For more information, see our sliding scale cost sheet. To discuss in more detail, contact us. PART OF AN ORGANIZATION? BE AN ANCHOR! Come as an anchoring organization and bring as many as 5 people from your team. We will focus on taking one of your campaigns through a full creative development process, from strategy to tactics, from innovative ideas to the brass tacks of successful action design. Our best people will be at your service. Only $1-2K. It’s an incredible value for the time, tools and skills your team will receive. The training to design and develop real-world actions that can be immediately deployed to serve your campaign goals. The ability to build innovative action ideas atop a solid strategic foundation, that focuses and maximizes their impact. Access to knowledge and skills already in your organization and team that have previously been unavailable. New, inspirational approaches to your work that revitalizes your team and get’s them fired up. An opportunity to form new alliances and recruit new blood. NOTE: If you are an anchoring organization, we will prepare select tools specifically attuned to your current campaigns. We have only 50 spots, and they are filling up fast. If you are interested in coming, please APPLY HERE as soon as you can. Our operators are standing by. We are expecting more applications than there are spots in the workshop. Not everyone who applies will be able to participate. We will start contacting accepted applicants on Feb. 1st. We look forward to having you in the room with us, along with some of the movement’s best trainers and creative campaigners, and watching your campaigns take shape! At the Yes Lab, we rely on our community. So we won’t sugar-coat it: we need your support… like now. For any $10/month or more recurring contribution, get special invitations to a series of live online conversations with the Yes Men. Give $100 or more and you'll get the above for one year, plus a signed copy of the New York Times Special Edition and an official (sort of) Presidential Letter of Appreciation. For $200 or more, you'll also get a signed copy of The Yes Men Fix the World. Yes Lab actions can be extremely effective at exposing the evil of the world's top corporate villains. Compared to the wealthy entities we're up against, we do a lot of good with very little money. This, this, this, this, and this! We are about 20% of the way to our goal of $75,000. The campaign ends in 14 days, on Dec. 31. If everyone on our list gave $2, we’d reach our goal. The average donation so far has been $62. We hope you'll consider making your contribution, offering a unique holiday gift to your favorite Yes Men fan, and emailing your friends and family. P.S. Our Action Switchboard's coming soon! Also, check out the trailer for The Yes Men Are Revolting (out in 2014). For more on the Kindle Project, click here. Carl Gibson and Steve Horn’s misleading and poorly researched story—about the links between Srdja Popovic, cofounder of Otpor! and CANVAS, and a crappy corporate spy outfit named Stratfor—does no one any good. Stratfor is evil, and Jeremy Hammond went to jail exposing them. Some of Popovic's choices—from talking to Stratfor in the first place, to working with activists in Venezuela to unseat a democratically-elected leader—can legitimately be called into question. But yellow journalism, like conspiracy theorizing, does a disservice to those with such concerns. By making unfounded allegations about Popovic's involvement with Stratfor, by claiming without justification that he shared activists' info before gaining their consent, and by puzzlingly giving far disproportionate weight to the idiotic assertions of Stratfor operatives, Gibson and Horn's story not only unjustly trashes one of our most effective and inspiring activists, but caters to perhaps the worst tendency of the Left: taking refuge in shallow paranoia and conspiracy theories rather than asking the really hard questions—and doing the really hard work. Popovic, perhaps mistaking Stratfor for actual analysts, continued to correspond with the Stratfor people, and, when they asked, gave them information on how popular movements work—which the Stratfor people didn’t take, perhaps not surprisingly given the radical nature of those ideas. Popovic also put activists in touch with Stratfor—always, Popovic says, with the consent of the activists. "Some people speak as if activists are a rare and fragile species living under glass jars," Popovic says. "But the activists I know did not become the world's top activists by living in jars. "In the case of the Egyptian revolution—which the U.S. did not support—I did put the April 6 people in touch with Stratfor. Stratfor was approximately the tenth organization I put them in touch with. Six months before that, in exactly the same manner, I had put them in touch with Al Jazeera, resulting in 'Seeds of Change,' one of the most important pieces about the revolution. "Should I have been concerned with what Stratfor is? Probably. But I'm sure the people in Egypt were spied upon by much more serious organizations—just as I was under Milosevic." Popovic's interactions with Stratfor seem pretty obviously innocuous on a casual perusal of the Stratfor emails released last month by Wikileaks. But the theory that Gibson and Horn prefer to relate, against all evidence, is a much more exciting and perhaps more emotionally satisfying one. In their version, Popovic is employed by Stratfor to help US interests, and to help Stratfor spy on activists on behalf of corporations and governments; also, he is funded by Goldman Sachs and is as powerful as a battle cruiser. They achieve these conclusions mainly through a seemingly purposeful sloppiness. For example, when Gibson and Horn add the Yes Men to the list of entities that Popovic helped Stratfor to spy on, they do it through a kind of juxtaposition that seems to be their stock in trade. After reeling out a laundry list of countries, including Egypt, whose activists Popovic supposedly compromised, the authors recount how Gibson and I met Popovic back in April 2011 and "gave Popovic information about both groups’ plans for the coming year and news later came out that Stratfor closely monitored the Yes Men’s activities." There is obviously no connection between our meeting with Popovic and Stratfor’s spying on the Yes Men (which was very far indeed from “close monitoring”). As Gibson and Horn know very well, Stratfor had already “spied” on us for quite a long time—several years before Gibson and I met with Popovic that day in 2011. Their purposeful juxtaposition, however, leaves an entirely different impression. Gibson and Horn also seem to give total credence to anything that Stratfor staffers say, no matter how silly. They quote Papic saying that CANVAS “basically go around the world trying to topple dictators and autocratic governments (ones that U.S. does not like ;)”—a phrase which manages to be patently false on several counts; CANVAS have in fact worked with activists from at least some 40 or 50 countries, many with movements that do not at all line up with US interests. Gibson and Horn also quote Papic ludicrously saying that CANVAS “just go and set up shop in a country and try to bring the government down. When used properly, more powerful than an aircraft carrier battle group.” A ridiculous statement, but by quoting it uncritically, the authors seem to be saying that Stratfor employs CANVAS to do just that. When Gibson and Horn assert that Popovic is funded by a Goldman Sachs executive, how do they know? The speculation of Stratfor staffers. Why do Gibson and Horn systematically take Stratfor's word over that of Popovic (whom they interviewed but hardly quoted), and quote Stratfor's emails as fact, even though at many points the Stratfor analysts acknowledge their conclusions are speculative or that they don't have hard evidence? Any other time, activists would critique and try to debunk Stratfor—yet Gibson and Horn choose to take them at their word, however obviously unreliable that word may be. At one point Gibson and Horn state that Popovic penned for Stratfor a report on how to unseat Venezuela's Hugo Chavez, even though Popovic told them explicitly in an interview that he drafted the report with Venezuelan activists, for activists, and with the knowledge from the outset that it would be made public and available for anyone to read, including governments or Stratfor. One can disagree with the very idea of working to unseat a democratically elected leader like Chavez, but the broad misrepresentations of Gibson and Horn's article do nothing to further this—or any other—discussion. Gibson interviewed me twice by phone for his article and I also wrote him extensively by email about how they were barking up the wrong tree—but nothing I said appeared in the article. Popovic told me he also wrote a six-page response to Gibson's interview questions, including much that challenged the article's narrative, but the authors chose to exclude him as well, except for a one-off quote at the end that they quickly dismiss. Was this shoddily-researched, nearly logic-free article custom-made to be divisive and sow discord, in the style of COINTELPRO, the FBI's '60s-era program aimed at discrediting and disrupting domestic political organizations? Or do Gibson and Horn just want to make a name for themselves at the expense of the truth and the reputation of a well-respected activist? Perhaps. But there's another factor in all this, that could make it even more damaging: the predilection for conspiracy theorizing that besets a lazy segment of the Left. The problem is, like yellow journalists, 9/11 "truthers" aren’t actually interested in the truth; rather, they need the WTC towers to have been knocked down by our government. They need the Bush administration to have been, against every last shred of formal and informal evidence, incredibly competent, and to have planned 9/11 and then miraculously kept the evidence so hidden that no experts of any stature at all would ever support it. As Assange notes, if you actually want to fight a conspiracy, there’s a whole smorgasbord to choose from. There’s the Trans-Pacific Partnership, a highly secretive and expansive free trade agreement that few people know about. There’s a Russian-Dutch partnership to exploit the Arctic. There’s ongoing COINTELPRO-style police surveillance of activists. There’s the Republican conspiracy to scuttle Obamacare. And the biggest one of all: the oil companies' conspiracy to make sure their value doesn't disappear. Real conspiracies are daunting, hard to deal with, and offer few opportunities for journalists to make a name for themselves. Gibson and Horn can do better. Let's stop looking for fake conspiracies amongst our activist allies, and get back to taking on the real conspiracy—global capitalism—that's destroying the planet. Last week, esteemed colleague President Obama sent you email asking you to seed Yes Men group with cash. Russia wishes to hereby erect our opposition. Like the Netherlands, Russia is well-endowed member of international oil community. But Yes Men hooligans make fun of Russia/Dutch coupling with stupid bear puppet in Amsterdam. That is gay to not only Russia, but to whole Netherlands people too. Russia is like real and extremely large and strong bear: Moscow at head, paws on Middle East, wild Arctic at rear. Dutch come to help Russia thrust deep and hard to tame that rear for all Man's benefit. Yes Men try to stop us, but limp fake bearhood is no match for firm real manhood of Russia and Netherlands ganging together. Do not support Yes Men. If you do, we treat each of your country's Sochi Olympics visitors just like we do with Greenpeace boat hooligans: we knock them up in jail. Our prices are so low, our customers are killing each other. At Walmart, we care, which is why we’ve created this Black Friday Survival Guide and coupon. Please share it with anyone whose survival matters to you or to someone you know. Wishing you safe and happy holidays for years to come. Tired of the same old routine? Consider donating to the Yes Lab so together we can make the holiday culture slightly less stupid. Barack Endorses the Yes Lab! Things are tough for me at the moment; as you may know, the website for my health care plan had a big glitch. If I were my predecessor, I'd order a full-scale attack on Webistan. Fortunately Webistan doesn't exist, so I've just had to deal. Dealing is hard. But I know in my heart that despite this glitch, and even if there are additional glitches, we will one day in this country have a health care system even better than Cuba's. How do I stay optimistic? Simple: as a one-time community organizer, I know that even when actions don't achieve miracles right out the door, the overall movement does often succeed. Even glitches can play a part in the triumph. Take, for example, that raggedy group of anti-corporate weirdos, the Yes Men. In 2009, the Yes Men and friends impersonated the US Chamber of Commerce to announce that the Chamber was no longer opposing climate legislation. A real Chamber rep barged in the door; the ensuing melee resulted in tons of hilarious media coverage–and even more when the Chamber sued the Yes Men. But so what? Well, two weeks after this action, the Chamber really did reverse its opposition. As my colleague Al Gore noted at the time, the Chamber's about-face was "not courtesy of the Yes Men"–—but their action was part of the wave that forced it to happen! Shortly after that action, the Yes Men formed the Yes Lab and have worked with a number of groups to pull off high-profile media actions around the groups' goals. None of those actions changed the world by itself. Some merely put the issue front and center for a few minutes, others for a few hours. Some of them even had website glitches as bad as mine. Yet most of the movements these actions were a part of succeeded! Shell's Arctic drilling program ended up failing, thanks to nature and Shell's own incompetence. Monsanto's GMO corn was banned in Mexico. New York City’s courts found Stop and Frisk policing unconstitutional, despite Bloomberg. So, movements can succeed. Isn't that comforting? It suggests that we, too, could one day succeed at achieving a level of health care for all Americans that's currently afforded only the wealthy, or prisoners—no matter how many glitches my website may currently have. The Yes Men prove it. Which is why you should support them as lavishly as you possibly can. Please help out my friends. They need all the help they can get. We all know the facts: the sixth greatest mass extinction in Earth's history is already underway—and this time it's all our fault. We all know about rising sea levels, epic floods and hurricanes, wildly fluctuating temperatures, and ever-more-deadly droughts. We know that bad things are happening, and we know that the people causing the mess are profiting from it immensely, while the poorest people are getting hurt most. In the face of these facts, it's no wonder we're often paralyzed. The scale of the unfolding disaster is simply too huge to stomach. And after a hard day at work, listening to more dire warnings has about as much appeal as sliding down the proverbial razor blade, and just sends us further into bewildered hopelessness. At the Yes Lab, we use humor to help journalists and other people talk about difficult issues that matter a lot—like "free" trade, global capitalism, and now the end of a livable planet. On that last theme, we mostly use humor to focus attention on the real criminals, the companies that are making off like the bandits they are. At its best, humor can break through the general paralysis and get more people to join the movement for climate justice. Humor can be a Trojan horse for important, mobilizing messages that don't qualify as news in today's corrupt media environment. Jokes aren't ends in themselves, but they can be important ingredients for bigger campaigns, drawing attention to critical facts without much of the preachiness that sometimes turns people off. Our upcoming movie focuses on our recent climate actions, and includes an inspiring personal story that is geared to get audiences acting for change. And with our soon-to-be-launched Action Switchboard, accessing tools, guidance, and partners for brand-new actions will have never been easier. We rely on our savvy, brilliant, and generous network to keep this stuff going. So please, if you can, help keep the Yes Lab afloat! For every dollar up to $75,000 we raise between now and Dec. 31, Kindle Project will match every dollar with a whole other one. That's two dollars for one! So if you haven't given yet, please do. And if you have (thanks! ), please urge your friends to do the same. This is reason #2 to support the Yes Lab, out of a total of 8. If you can't donate financially, you can still help us by sharing this campaign with your friends. You can email it, tweet about it with @theyesmen and we'll retweet you, and/or Facebook about it and tag the Yes Men or The Yes Men Are Revolting.